Beat eggs for a long time until they are a pale yellow color. Beat in sugar and stir in rest of the ingredients. Spray a jelly roll pan with cooking spray or line it with wax paper and bake at 350 for 8-12 minutes. Lay out a pillow case or a flat dish towel and sprinkle it with powdered sugar. Invert cake on top of towel and roll up immediately. Let cool completely. Frost, roll back up, and refridgerate. Sprinkle with powdered sugar and nuts (if desired) and serve. 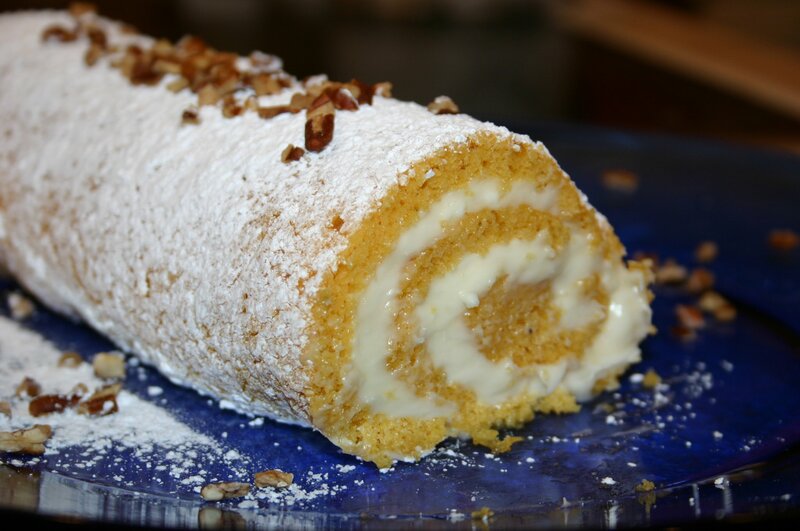 Click here to download Cream Cheese Pumpkin Roll Recipe to Cook'n.